Seloc Marine engine maintenance and repair manuals offer the most comprehensive, authoritative information available for outboard, inboard and sterndrive engines, as well as personal watercraft. 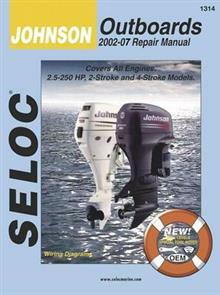 Seloc has been the leading source of how-to information for the marine industry since 1974. Designed and written to serve the needs of the professional mechanic, do-it-yourself boat enthusiast, instructor and student, these manuals are based on actual teardowns done by Seloc's editors/authors in our on-site facility. Recognized and used by technical trade schools as well as the military, every manual provides complete coverage on everything from basic maintenance to engine or drive overhaul; featuring simple to follow, step-by step, illustrated procedures, hundreds of exploded drawings, photographs and tables, maintenance intervals, troubleshooting sections, accurate specifications and extensive wiring diagrams. New on all later manuals is an extensive skill rating system for each procedure which also includes special tool icons.